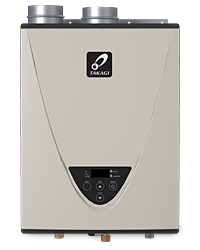 The T-H3J is a high efficient, condensing tankless water heater perfect for residential applications. The T-H3J can produce enough hot water for two bathrooms in warmer climates or 1.5 baths in colder climates. The 9008847005 Non-Return Valve is a must-have item for common venting system. It prevents the escape of combustion gas through non-operating appliances. The 9007611005 Concentric PVC Termination is used when terminating direct-vent (sealed combustion) systems, with Indoor models that require a 3 in. (76 mm) intake and a 3 in. (76 mm) exhaust. This concentric termination provides the convenience of only having to make one penetration through a sidewall instead of two separate penetrations for the intake and exhaust piping. The termination includes a bird screen, restricting small animals, pests, and foreign objects from entering into the vent system.